Safaricom is at it Again With Personalized Tunukiwa Daily Offers: Did They Get it Right This Time? If you thought the price wars between Kenyan telcos was over, you thought wrong. After Airtel announced their “Tubonge Bundles” targetted at offering cheap calls to its subscribers, Telkom Kenya (Orange) announced their “Amkia MBundle” which offers subscribers of the bundle free 50MB data bundle valid from 6am to 8am daily. You may have seen a Safaricom advert on TV or YouTube featuring the “Serikali Saidia” lady. The advert talks of “Tunukiwa Daily Offers” but the intended message doesn’t come out well. Sidebar: Dear Safaricom, what happened to the really cool adverts you used to have? From M-Pesa adverts to Niko na Safaricom? As tradition, I will help you understand what Tunukiwa Daily Offers are all about and we’ll see whether they are a good deal or just something you should let pass by. The offers vary from Calls, SMS and Data. I am not sure if you can purchase all the three bundles or you’re just limited to one. Safaricom says that the bundles offer calls for as low as 2bob per minute, which I welcome very much. My colleague Kiruti, has a data offer for 420MB for Ksh.140 which might sound like a good offer until you realize that you can buy a 150MB daily bundle for Ksh.50. Buy the daily internet bundle three times and you have 450MB for Ksh.150 plus 450 texts to play around with. Another has an offer for 165MB for Ksh.55, which again is still not a good deal as you get with the traditional daily internet bundles. Whether you get a good deal or not, depends entirely on your usage. Personally, I have a data offer of 75MB for Ksh.25, which is cheaper than you would get with any daily internet bundle. When we look at SMS however, that’s where the deals are. 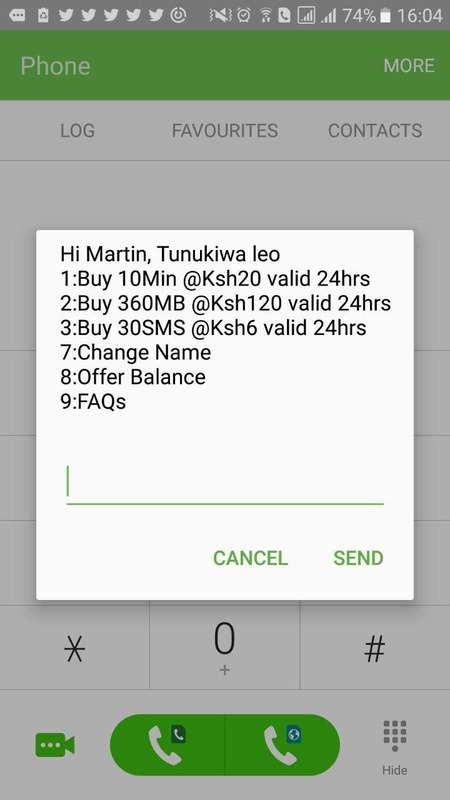 I got 125 SMSs offer for Ksh.10, if I sent that many texts daily, I would be jumping at this. Safaricom does not specify who they are targeting with this offer but basing on the fact that the sweet deals are mostly on SMS and not Data, I would say, this one is not for you smartphone users, you already have FLEX anyway. As a relief to Safaricom (I know you read this), I am not against this offer. So far, it sounds good and will probably be celebrated by more people than those who dismiss it. You should try the Tunukiwa Daily Offers and you could get a deal that you’ll probably love. Good job on this one Safaricom. My account on txt offer is amazing, for 8/- I see its 200 sms. Sounds like algorithms have moved from social media to allocation of resources by Telcos, in this case Safaricom. Wait so the bundles you get are only valid for 24 hrs?